So I decided that the best way for me to get in daily fitness is to get them to encourage me by doing it together. We came up with a plan. For 1 month, we’ll get in 30 minutes of “movement” a day and by movement, I mean some sort of fitness/exercise. And my promise to them? That along with all the benefits they’ll gain by staying healthy, I’ll also take them someplace to reward them for their efforts – one of those jumpy house places. What kid doesn’t love those, right?! I printed off a blank July calendar and for each day that they get in their 30 minutes of movement, they get a gold star sticker. (Does that take you all back to elementary school or what?!) I picked up a pack with hundreds of those gold stars at the dollar store. Talk about a simple and inexpensive rewards chart! We also jot down what movement we got in that day. The other day we walked along some trails for an hour so they each put 2 gold star stickers on their charts for that day. Great way to start us off! I just wanted to share this with all of you in case you wanted to have a month of movement challenge yourself. You don’t need to wait until the first of any specific month. Just start and go 30 days from that point. The important thing is, that you start! Map My Walk – I love this one! You can sign-up for Free. I downloaded the App to my phone. Whenever my kids and I start walking, I just click a button and it keeps track of our route, how far we went and how long it took us. The kids love checking out our stats when we are done. My Fitness Pal – This is a good one for keeping a food journal and exercise log. I just started getting into the habit of logging my meals as I usually have my phone nearby and it only takes a few minutes. It’s so educational to see how calories can add up even when you think you are eating healthy. What I like about this one is your friends can join and you can cheer each other on to help reach your goals. Fitbit Flex Wireless Activity + Sleep Wristband – I have heard really good things about this. It does have a higher price tag but if in the end it helps you stay healthier, it might just be worth it! Thermos FUNtainer Bottle – These are so great for helping keep the kids (or even yourself! ) hydrated. They sell these at places like Target, too. What I like about the newer generation ones is that they have a handle on them. ~Soccer, Basketball, Baseball, Softball, Hockey, Tennis, Football, etc. ~Hiking – Turn it into a Nature Scavenger Hunt! ~Jumping Jacks, Toe Touches, Stair Climbs, etc. There are so many ways to get movement without it costing you a lot of money. Summer is an especially great time to start this as the weather is nicer and you can get outside a lot more. I’m hoping you and your family (and friends!) will challenge yourself to get in some extra movement even if it’s just a few days a week! Saturday June 28, 2014 is the “Great American Backyard Campout” day. If you are looking for something fun to do with your family that weekend, why not make some new memories by camping under the stars? If you don’t have your own backyard, call up a friend that does and have your families camp together! 8) Mosquito Spray, Sunblock, First-Aid Kit, etc. 9) Games, Magazines, Books, etc. We actually have a little firepit where we roast hot dogs and marshmallows. And if you want to make a special treat, pick up a “Pudgie Pie Maker” that you can use to make sandwiches or little pies. All you need is bread and a can of pie filling. We tried these for the first time last year and they tasted like a warm apple pie straight out of the oven! Check out some cool Pudgie Pie Recipes on Pinterest! 1) Play a game of tag. Better yet, play a game of flashlight tag! 2) Try to catch some fireflies. 5) Have a good chit-chat in front of the fire. $.75 Off Reynolds Wrap Product Coupon – you can take some meat/veggies, wrap them in foil and cook them over the fire. Just use caution when you open them! 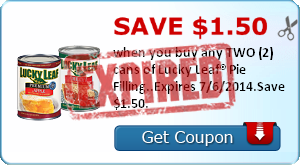 Also, SavingStar has an eCoupon that will earn you $1.50 back wyb 2 Lucky Leaf Pie Fillings that will come in handy for making those pudgie pies. I highly recommend the apple! While the first year may be a bit of an investment if you don’t own your own tent and camping gear, it is a very frugal outing going forward as you can reuse everything annually. I hope you’ll try this fun way to camp if you haven’t already. Happy Camping if you do!